Jim suggested this topic because we recently finished the Netflix show, The Last Kingdom, and he’s been reading the books by Bernard Cornwell. He tells me the books go into a lot of detail about Uhtred’s pagan customs. I’ve mentioned the pagan origins of Christmas before, although I once made the mistake of referring to them while in a K-Mart and turned around to find a stranger glaring at me. Today, the term Yule is used in most of the English-speaking world as a synonym for Christmas, but today I want to talk about the pagan Yule traditions that predated our Christian ones. As you may know, Yule was originally a midwinter festival celebrated by the Germanic people who populated Northern Europe and Scandinavia and came to settle in England as well. Those original celebrants of Yule considered the Yuletide period to last about two months, beginning in about mid-November and extending to early January. There’s just something about this time of the year that makes people want to set fires and get drunk. Gee, I wonder why that is. Pagan Yule traditions included a feast, which customarily took place in a temple, to which farmers would bring livestock for sacrifice. The drinking of ale was mandatory, just like it is today. The sacrificial animals were eaten at the feast, and their blood was sprinkled on the walls and idols of the temple, as well as the men within. While the midwinter sacrifice in the West European Stone and Bronze Ages may well have had an element of ancestor worship and veneration of the cult of the dead, it’s unclear whether this aspect survived into more recent Germanic pagan times. 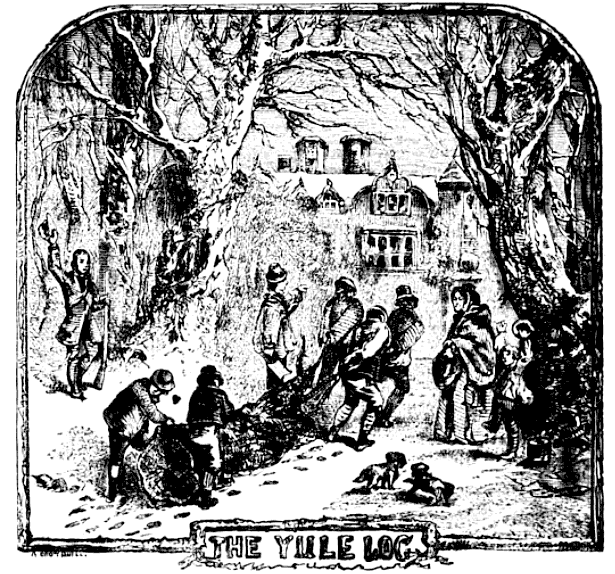 Other Yule traditions, such as the Yule log, a massive log that, in the Middle Ages, was burned throughout the Twelve Days of Christmas, may also have their origins in Anglo-Saxon paganism. In medieval times, the Yule log was believed to have magical properties, including the ability to ward off lightning, mildew, toothaches, and assorted bad luck. In some parts of Spain and France, the log was believed to “defecate gifts,” according to historian Gerry Bowler. The origins of the Yule goat do go hark back to pagan traditions. The god Thor is said to ride through the sky in a chariot pulled by two goats named Tanngrisnir and Tanngnjostr. The significance of the goat has its roots in the Indo-European god of harvest and fertility, a white goat named Devac or Dazbog. The last sheaf of grain bundled during the harvest was believed to have magical properties and was kept for the Yule celebration; the spirit of the Yule goat was said to visit in the days before Yule to ensure that preparations were being made correctly. Neighbors would prank one another by hiding a wooden or straw Yule goat in one another’s houses; if you found such a goat in your house, you had to get rid of it by hiding it in someone else’s house. No word on what would happen if you didn’t. A modern Yule goat Christmas ornament. Part of the pagan celebration of Yule involved sonargöltr, or the ritual sacrifice of a boar. 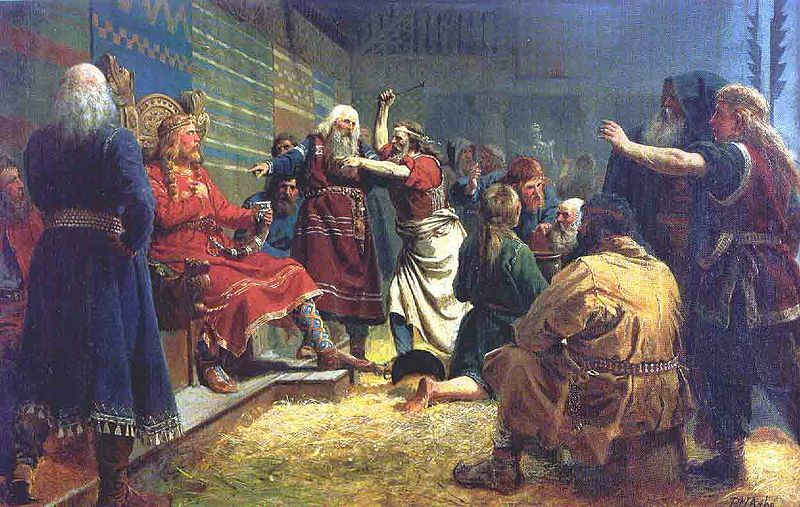 TheSaga of Hervor Heidrek mentions the swearing of an oath on the bristles of a Yule boar, after which the boar is sacrificed. The blood of this boar could then be used for divination. The sacrificial boar may be the oldest continuing Yuletide celebration. In modern times, it’s echoed in the Boar’s Head Feast, which takes place at Queen’s College, Oxford, Hurstpierpoint College, and at various churches and universities in the U.S. and Canada. The sonargöltr may also be why many consider ham to be the traditional Christmas meat. King Haakon I of Norway, aka Haakon Haraldsson or Haakon the Good, is credited with the Christianization of the Yule season, and of Norway itself. King Haakon himself was a Christian, but many of his people were pagan, so he decreed that Yule celebrations were to take place at the same time as Christian Christmas celebration. The guy in red is King Haakon, I think. I don't know Norwegian.